How to make the best homemade pesto with basil, nuts, garlic, and olive oil. Jump to the Easy Basil Pesto Recipe or read on to see our tips for making it. Pesto is simple to make and a versatile sauce for pasta, meats, or vegetables. We use our food processor, which makes it quick. You can also make it by hand using a mortar and pestle. 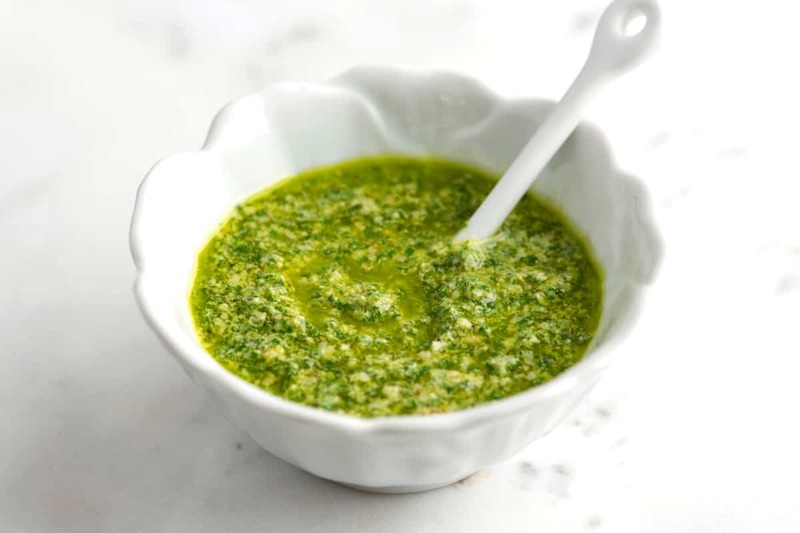 YOU MAY ALSO LIKE: This easy Chimichurri Sauce recipe. 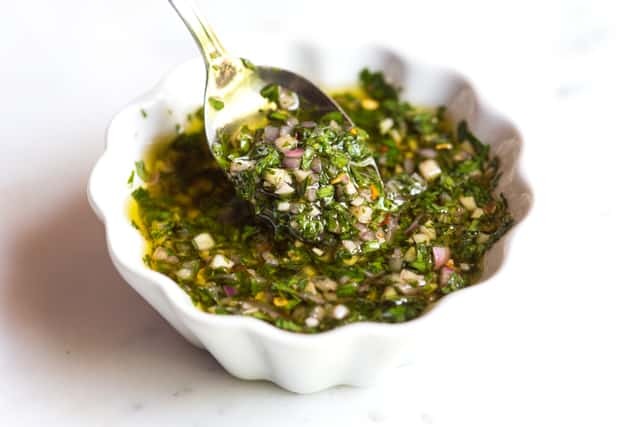 Chimichurri is a sauce made with herbs, garlic, vinegar, chili pepper and olive oil. It livens up pretty much anything you throw at it. We love this recipe and make it often (especially in the summer). It’s quick and easy to make. Let me show you how to make it plus our tips for making it best. Pesto is easy to make. 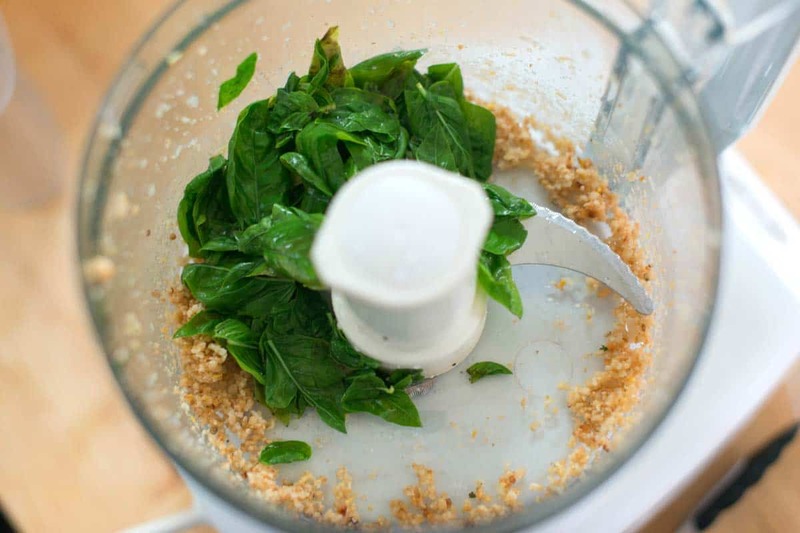 Throw garlic, nuts, and fresh basil into a food processor then drizzle in olive oil until you have a sauce. Tip 1: Blanch the basil. I know this sounds a little crazy, but trust me. Blanching basil makes the greenest pesto possible. Have you ever noticed that pesto browns overtime in the fridge? Or even when you add it to hot pasta? Blanching the pesto prevents this. It locks in the bright green color of the leaves. We blanch basil in our recipe below. If you are not convinced, you can still use our recipe without blanching. It still works. If you are up for it, blanching is easy. Dunk the basil leaves into boiling water for 5 to 10 seconds then submerge in ice water. Pat the leaves dry and move on to making the pesto. Tip 2. Turn the garlic into a paste. We love garlic but are not big fans of biting into a big chunk of it (especially if it’s raw). That’s why we turn the garlic into a paste before adding it to our pesto. 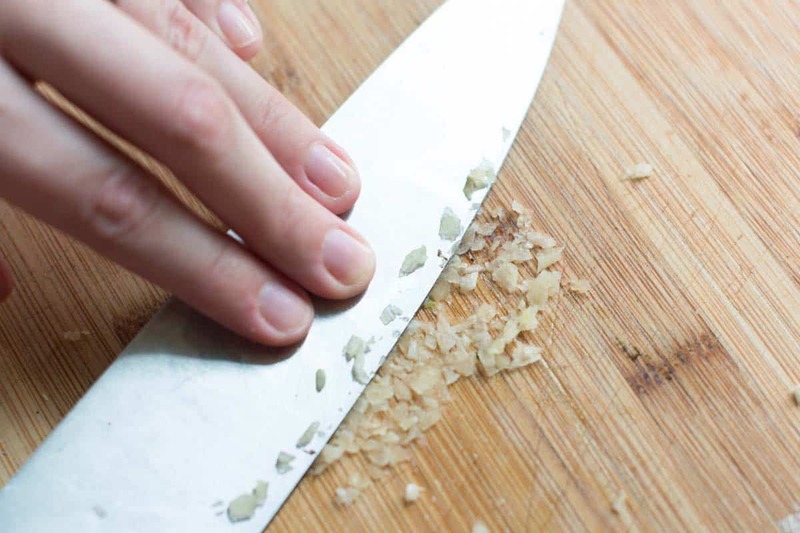 To do this, mince the garlic then use the flat side of a knife to scrape the garlic across a cutting board. Tip 3: Stir cheese in at the end. A little texture in the sauce is a good thing. We don’t add cheese to the food processor, we make the pesto and then stir in grated parmesan cheese by hand, which adds some texture. If you cannot find pine nuts, try walnuts instead. They are buttery and work well in pesto. You can also make pesto without nuts. The texture will be different, but the sauce stills taste fresh and delicious. Add more herbs. Add a handful of parsley or mint leaves to our recipe below. Make vegan pesto. Substitute the cheese with a non-dairy cheese or add 2 to 3 tablespoons of nutritional yeast. Nutritional yeast is nutty and cheesy. Add greens. Replacing some, if not all, of the basil with spinach, chard, or beet greens is an excellent option. We’ve even done this with kale before. What to do with pesto? Toss it with hot pasta or add a layer to baked pasta. See our Baked Spaghetti with Pesto or Baked Ziti with Spinach and Pesto. Mix it into dips, other sauces, and spreads. 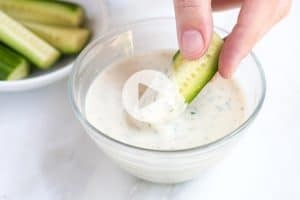 Think about adding a spoonful to tahini sauce or even guacamole. Spoon it over eggs. We especially love a little added to scrambled eggs. Replace traditional red pizza sauce. Pesto is pretty potent, so a little goes a long way. See our Butternut Squash and Pesto Pizza Recipe. Spread it onto sandwiches or even in the middle of quesadillas. See our pesto chicken quesadillas recipe. Mix it into salad dressings. Try adding a spoonful to potato salad. Top or toss with vegetables instead of butter. Add a layer to tomato bruschetta. Add a spoonful to soups and stews. YOU MAY ALSO LIKE: We love quick, fresh dinners. These soba noodles tossed with basil pesto hit the spot. 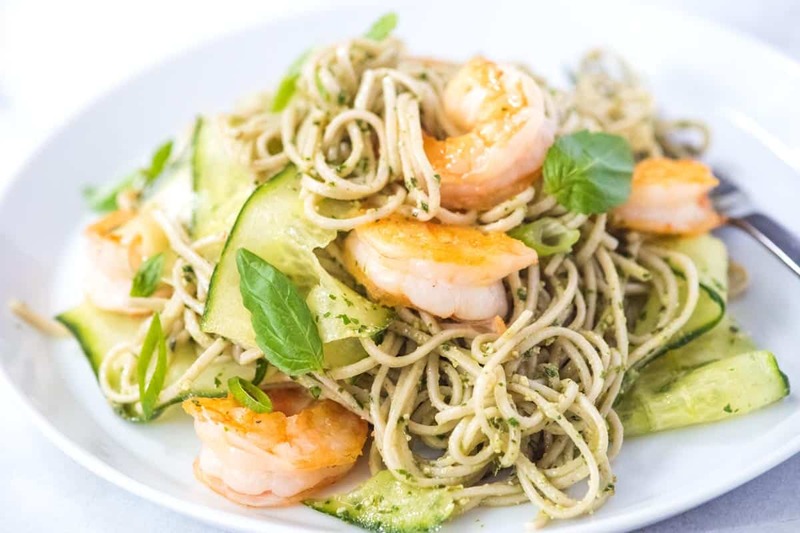 Jump to the Pesto Shrimp Soba Noodles Recipe. This basil pesto recipe won’t turn brown the moment you make it or toss with hot pasta. By quickly blanching the basil, which takes under 10 seconds, we set the basil’s green color and help prevent it from oxidizing over time. It’s an extra step in making pesto, but it doesn’t take long to do. If you prefer to not blanch the basil, you can skip it. Our recipe can be made with fresh or blanched basil. Prepare a small bowl of ice water. Bring a small saucepan, filled halfway with salted water, to a boil. Submerge basil leaves in boiling water for 5 to 10 seconds, or until wilted. Then, immediately plunge into ice water to stop cooking. Drain, squeeze to remove excess water then pat dry with a clean dish towel. Smash and peel the garlic clove then mince. Holding a chef’s knife at an angle, scrape the blade of the knife across the minced garlic. Gather it all together then scrape it against the board again until it becomes a fine paste. 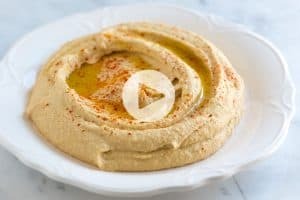 Combine the garlic paste and the pine nuts in the bowl of a food processor. Pulse 2 to 3 times until everything is chopped small. Add basil. With the processor running, slowly pour the olive oil into the bowl. After adding all of the oil, check the consistency of the pesto — we like it to have some texture. For smoother pesto, pulse a few more times. Transfer pesto to a bowl then mix in the cheese. Season to taste with salt and pepper. Use immediately or store for later. How to Store Pesto in the Refrigerator: Add a thin layer of extra olive oil to the top (to prevent any air from getting to it), cover with a lid or plastic wrap and refrigerate up to 2 weeks. How to Freeze Pesto: If freezing, leave out the cheese. Fill ice cube trays with pesto, freeze until hard. Then store frozen cubes in freezer-safe plastic bags. Freeze up to 1 month. Thank you for a great recipe. I made exactly as written first time. Second time i have abundance of basil. Insead of blanching I added 2 teaspoon of fruit fresh.yes it work@ retaining color.added to brighten flavor. 1 tbs lemon juice. I need freeze with cheese and cane out fine.thank you for sharing. The joy of cooking everyone adds their twist & we pick up tips from others. I blanched then ice water then squeezed water out. Now I only have 2 T of basil for the pesto. The volume is gone. Similiar to cooking spinach. Will this still work? Yes, you should be fine. When you blanch the basil, it does wilt down like spinach. Blanching works beautifully. I would only add that I prefer to get the blanched leaves as dry as possible before putting them in the blender with the other ingredients. I find that the extra moisture waters down the flavor a bit, and makes the pesto a bit creamier than I like. To dry the leaves, I open up each large leaf on a towel, pat the leaves dry, and then let them air dry completely. A little time-consuming to be sure, but we’re all looking for the pesto we already know and love. We like it with untoasted pine nuts, only the best EVOO and double the garlic! Just made this tonight. Works GREAT! Stayed green from start to finish. Thank you! Besides blanching the basil, I add a vitamin C tablet into the blender. 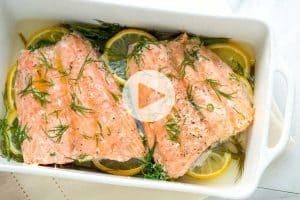 Saw a TV chef do this, not real sure if it helps, but the blanching sure does? It doesn’t take very much… I use a 1/4 tablet Vitamin C… As an antioxidant, Vitamin C also slows / stops color degradation of a pesto! Could the basil leaves be frozen after they are blanched? Would they then be suitable for making pesto a month or so later? I had never heard of this technique, but I will certainly try it. My DH could just eat pesto with a spoon, he loves it that much. I do add a squirt of lemon juice to my pesto. It brightens the flavor a little. I use walnuts or pecans instead of pine nuts, which I think taste stale in the pesto. Maybe toasting the pine nuts would make a difference. 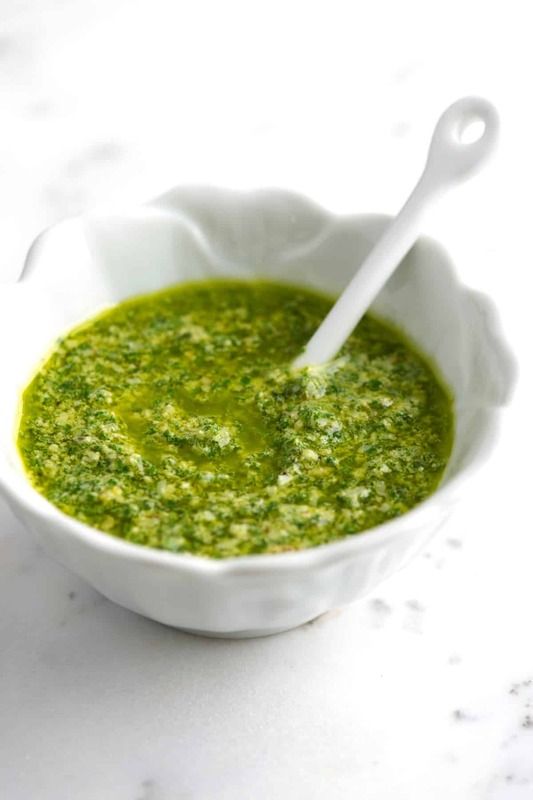 If you plan on freezing, we suggest making the pesto first then covering it with a thin layer of oil. That will help prevent discoloration when you freeze. I use the blanching method and it definitely works. I make batches during the summer months and freeze for later. If I’m going to freeze, I mix the pesto, nuts (I use walnuts), garlic, a very small amount of oil, and a touch of lemon juice, but I omit the cheese. I freeze the mixture in small Ball canning jars. Don’t fill the jars all the way to the top – leave room for the pesto to expand when it freezes. I also place a small piece of Saran Wrap on top of the pesto prior to placing it in the freezer. You can also place the mixture in ice cube trays, cover with Saran Wrap and then freeze it. After 24-48 hours, take the pesto cubes out and place in a Ziploc freezer bag, and return to the freezer for individual servings. When I thaw the pesto, I then add additional olive oil and the Parmesan cheese. The cheese just doesn’t freeze well with the other ingredients. My family and I enjoy pesto all winter long!! Enjoy. I have tested many pesto recipes this season while I harvest a good amount of basil. This is by far the best. Toasted the pine nuts and used roasted garlic. This will be my go to recipe for sure. So excited to try this. I have made pesto for 20 years now but have noticed it seeming really dry and bitter…I will let you know. olive oil. Also, I prefer to brown pine nuts in an oven. believe it would not be good even with a lesser amount of lemon juice. always be precise. There small lemons, medium, large and extra large, etc. Take a guess. Glad you found us them 🙂 Extra virgin olive oil is a great option for pesto. Lemon juice could work, but we’d probably just spritz a little on whatever we were adding the pesto to. Thanks for sharing! I am making this for work tomorrow. I want to make it a day in advance should I mix with the pasta and then fridge it til tomorrow or keep pasta and pesto separate until tomorrow? We’d keep the pasta and pesto separate then mix just before serving. Thanks for your recipe. All the tips and information is exactly what I was looking for. My first time making fresh pesto. Followed the directions exactly and it came out delicious! You are so right – this worked like a charm. Just did it with the batch I made tonight and the difference between that and the pesto I made a few days ago is remarkable. Great tip! This is genius! I will absolutely be using this recipe and technique next time I make pesto. Thanks for sharing!